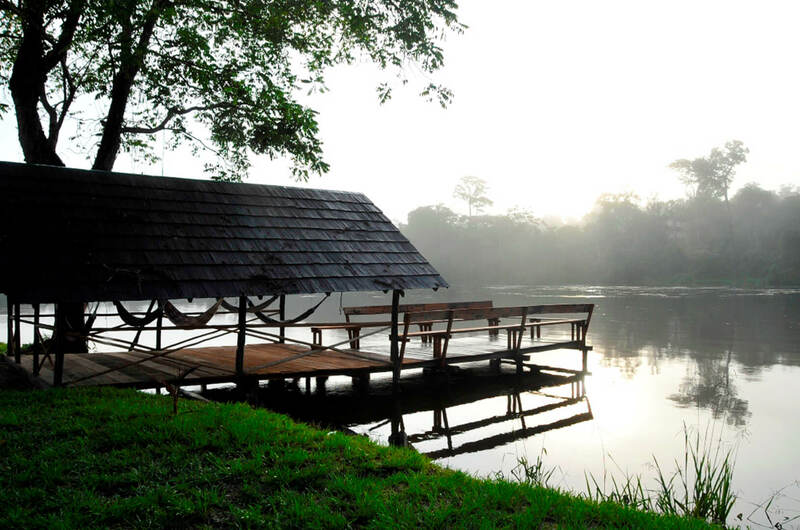 Palumeu Jungle Lodge, close to an Amerindian village bearing the same name, is situated along the upper Tapanahony River, in the midst of the Amazon rainforest. 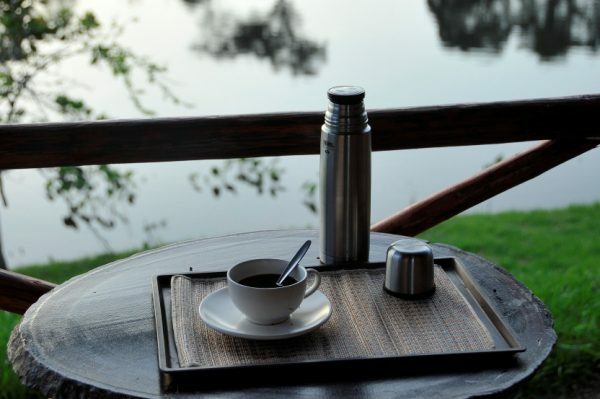 This is an ideal holiday resort for nature lovers. 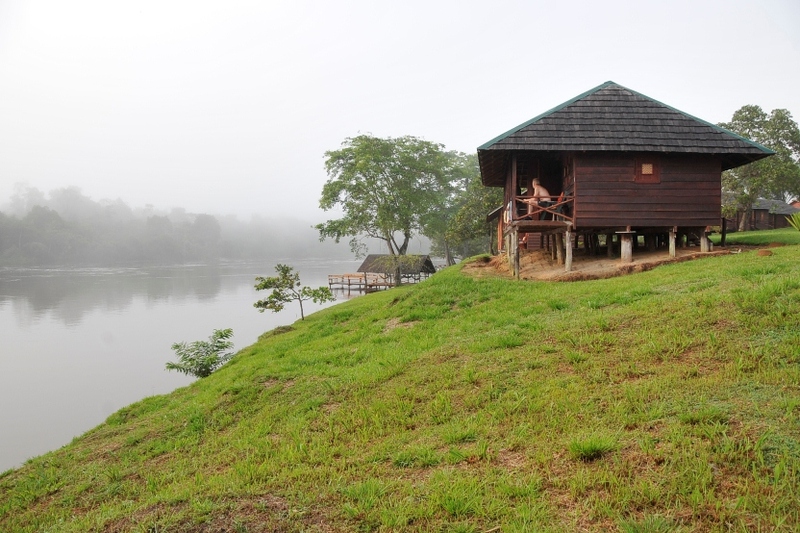 The walk and climb to “Poti Hill”, which offers a breathtaking view over the river and mountaintops of the southern part of Suriname, beneath, will remain in your memory forever. 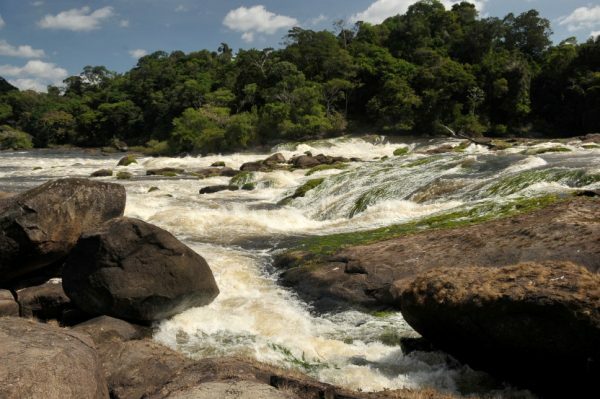 In this part of the tropical rainforest, where howler monkeys and birds announce daybreak, the impressive rapids, flora and fauna of the Amazon rainforest and the current lifestyle of the Amerindian tribes, the Trio and Wajana, will surely fascinate you. 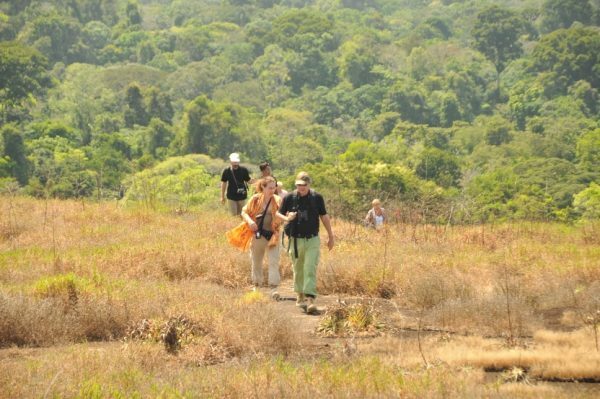 This tour is recommended for all those who wish to enjoy the pristine Rainforest and to learn more about the culture of the Amerindians. 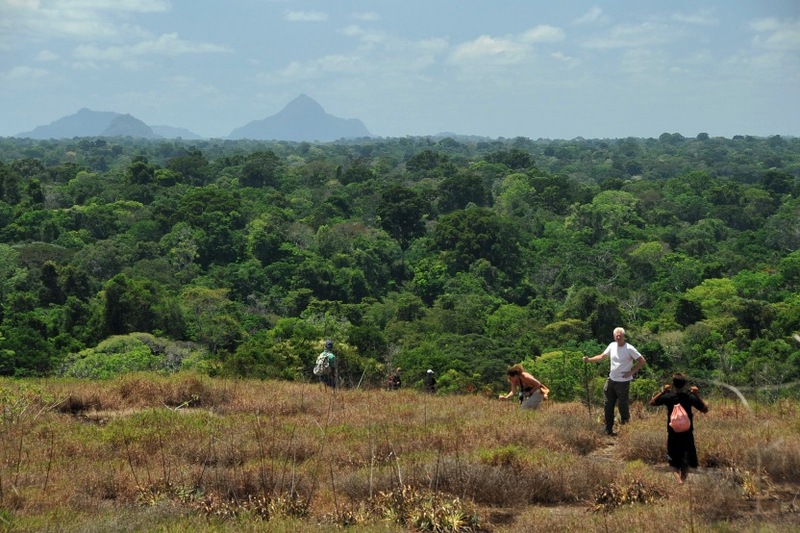 You fly from local airport Zorg en Hoop to the airstrip near the Amerindian village Palumeu, approx. 75 minutes by small airplane, south of Paramaribo. Upon arrival, you are greeted by our local staff. 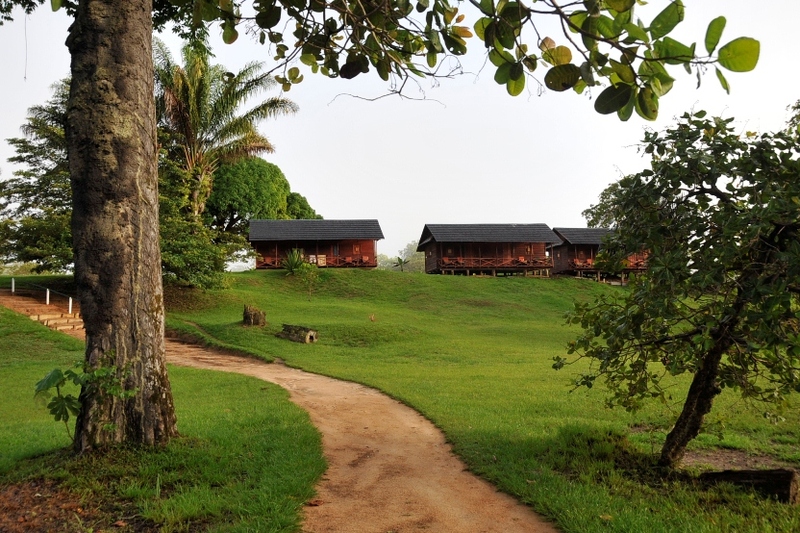 Jungle lodge Palumeu has the same name as the adjacent village of the Trio and Wajana Amerindians. After check-in, our staff takes you to the beautiful Palawa Island for a picnic lunch. Afterwards, you can enjoy swimming in the refreshing river water. 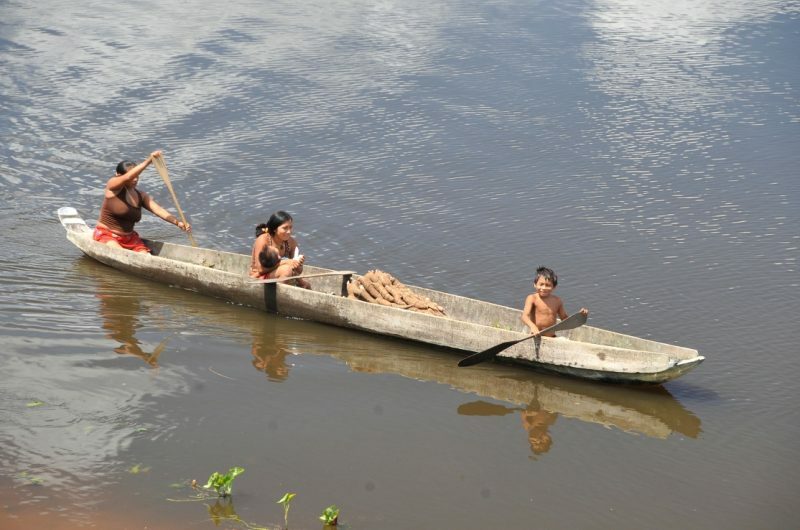 In the afternoon, our guide takes you to Amerindian village Palumeu for a first meeting with the current lifestyle of these ancient-old inhabitants of the Amazon rainforest. You will not miss out on the various eco aspects of our lodge. Our staff consists of skilled Trio and Wajana Amerindians. 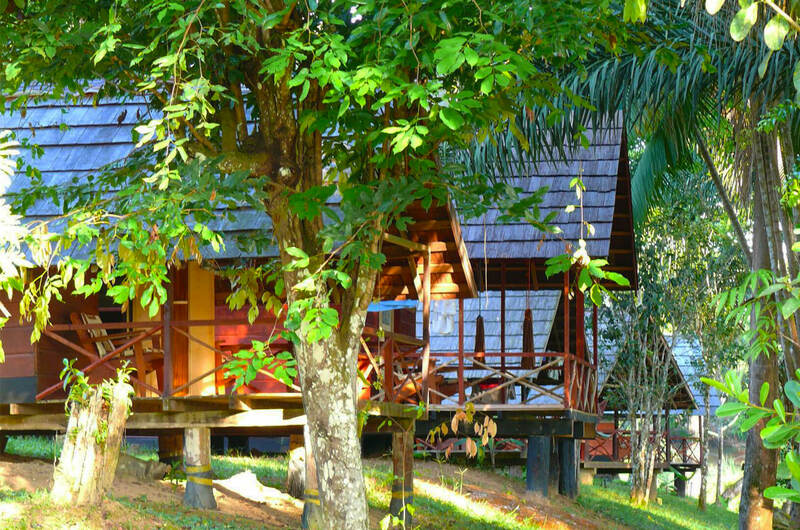 Your jungle cabin is built in traditional style and the cool evenings make air-conditioning or a fan unnecessary but you will indeed enjoy the comfort of a mosquito net. At night, use is made of solar energy for atmospheric lighting and the meals are prepared on a wood fire with primarily Surinamese ingredients. After dinner, the guide gives you more information about the oldest inhabitants of the Amazon rainforest, the Amerindians. to see various types of birds such as macaws flying over or parrots and toucans, and maybe even apes or an otter. 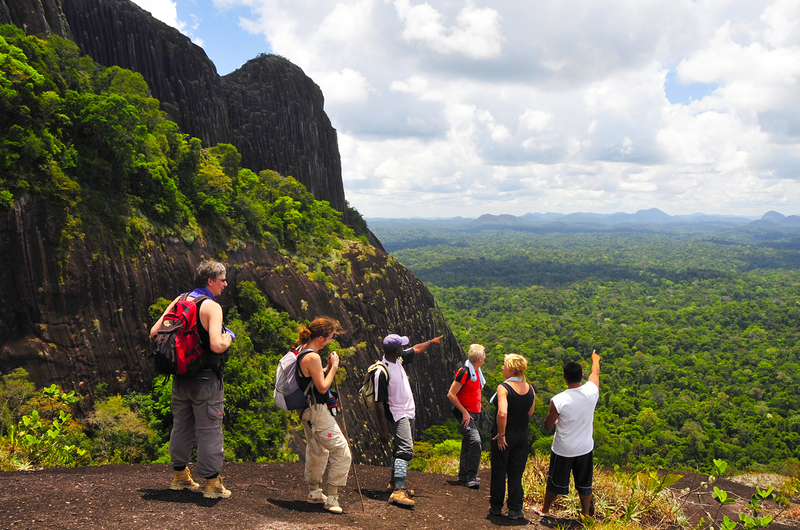 At the top of Poti hill, you will be rewarded with a magnificent view over the canopy of the jungle. Lunch is served at Palumeu. 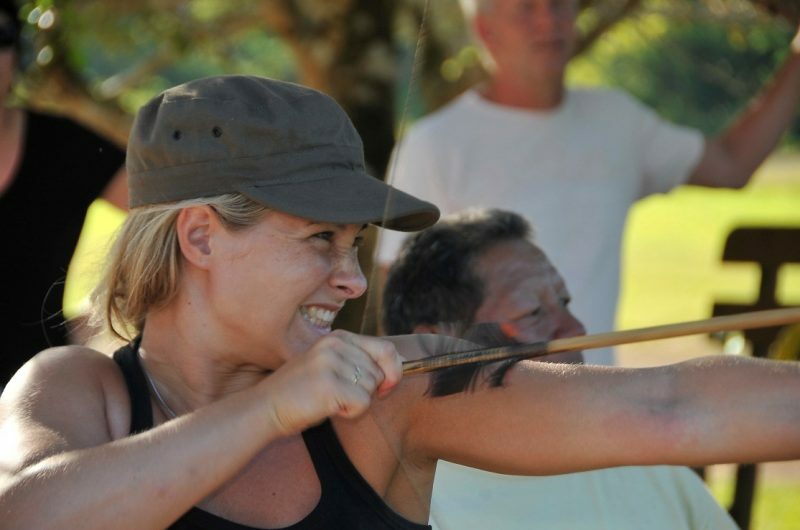 In the afternoon, a skilled bow and arrow shooter will show you the tricks of the trade. It looks easy but hitting the target appears to be a real skill. Try it out and see if you are a natural talent. Late afternoon, at sunset, we walk up a forest trail, close to the lodge, to spot birds and caimans. After dinner, the guide gives you more information about the unique flora and fauna of the Amazon rainforest. After breakfast, we take you to the Mabuka rapids by dug-out canoe for a day of true relaxation. 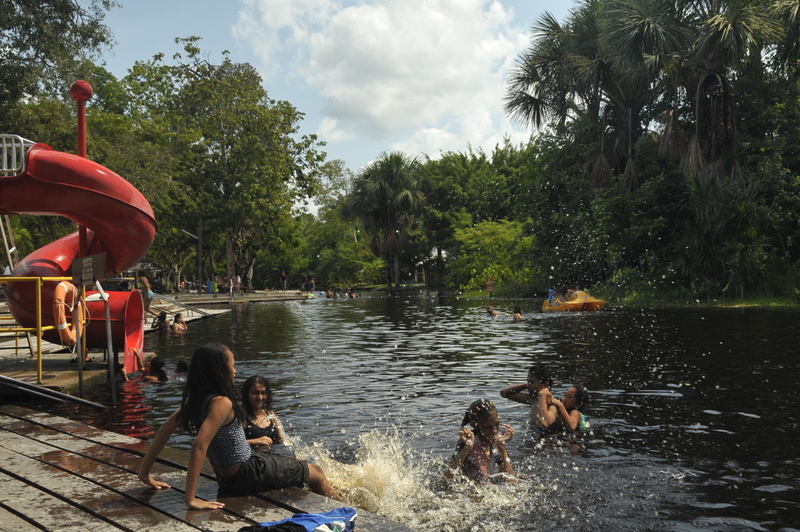 You have the opportunity to swim in the river, enjoy a natural massage in the waterfall and relax in a hammock. For active participants, there is a walk through the jungle with information about trees, plants and animals on the way. The surroundings make the barbecue lunch an unforgettable experience. Late afternoon, we return by dug-out canoe to the jungle lodge. 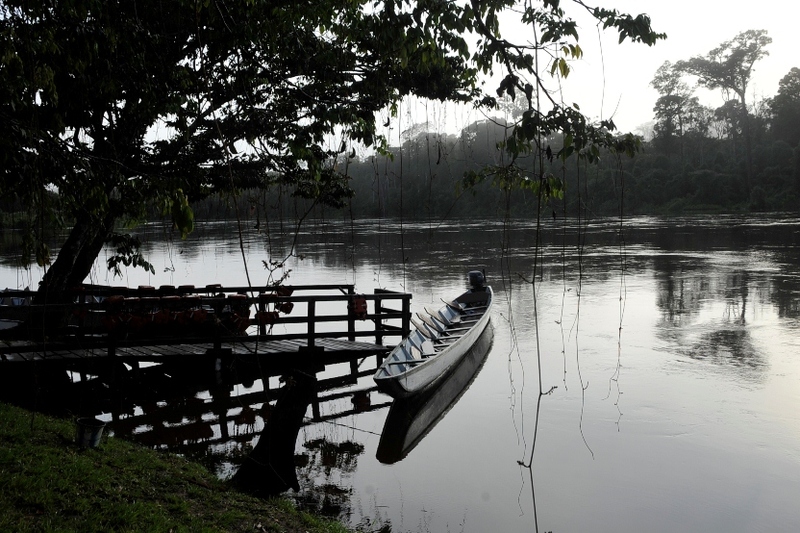 After dinner, our guide takes you on a night trip on the river to enjoy the jungle sounds. Early morning, at dawn, we float downstream with the boat for a while, so that you can enjoy the early morning jungle sounds. After breakfast, we go for an extensive walk in the village. Along the way, you have the opportunity to purchase traditional handicrafts. After lunch, departure for your return trip to Paramaribo. In the morning, the guide takes you on a jungle hike. You learn more about the flora and fauna of the tropical rainforest. In the afternoon, you can swim or relax in a hammock to enjoy the peaceful surroundings and sounds from the tropical rainforest. 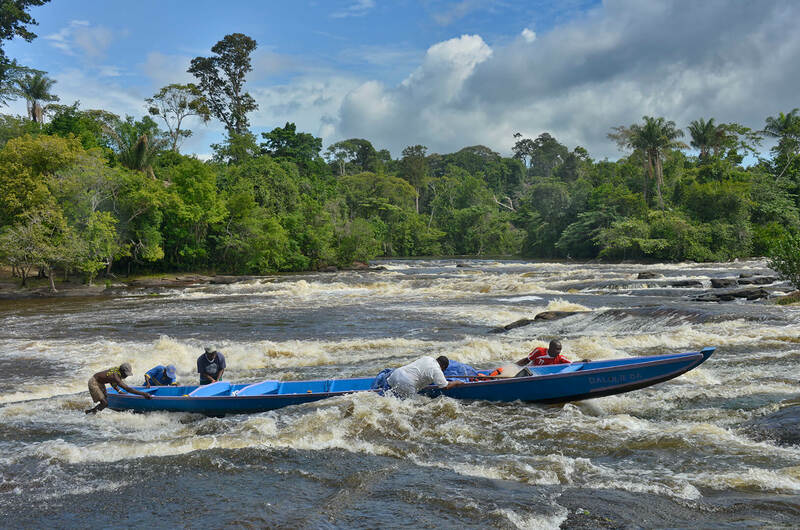 Early morning, at dawn, we float downstream with the boat a while so you can enjoy the early morning jungle sounds. After breakfast, we go for an extensive walk in the village. Along the way, you have the opportunity to purchase traditional handicrafts. After lunch, departure for the return trip to Paramaribo. Echt een aanrader voor de natuurliefhebber. We zijn in Awarradam en Palumeu geweest. Zien hoe de stammen daar leven is al bijzonder, en de prachtige natuur is adembenemend. Zo veel mooie vogels gezien! Elton is een fantastische gids. Met de engste vlucht van mijn leven tot nu toe landen we in de jungle van Suriname aan de Tapahonyrivier waar 2 indianenstammen vredig naast elkaar leven. De lodge is niet het eigendom van de indianen, maar vele uit het dorp werken daar in verschillende functies. Je wordt niet geacht je op eigen houtje in het dorp te begeven. Maar er zijn 2 momenten die volop laten zien hoe de mensen nu leven. Sommige dingen nog zoals in de vroegere dagen en andere wat meer aangepast aan het huidige leven. Er is een scala aan bezigheden. Wandeling met uitleg over de kracht van de bomen, akkertje waar de indianen hun gewassen planten, Potyhil, uitzicht boven de bomengrens. Lekkere wandeling er naar toe met een klimmetje als toetje. Maar dan heb je ook wat. Kanoen, met de stroom mee in je zwemvestje de rivier afdrijven. Prachtige watervallen. Dit alles zonder wifi en compleet verzorgd. Het enige wat je hoeft te doen is op tijd aan tafel te schuiven en je bezigheid te doen. Het was afkicken bij terugkomst in Paramaribo. Goed verzorgde trip door Mets. Wij hadden een super goede gids. Scheelt natuurlijk ook!